Feature-packed pedal allows user to "combine familiar effects to create new textures." 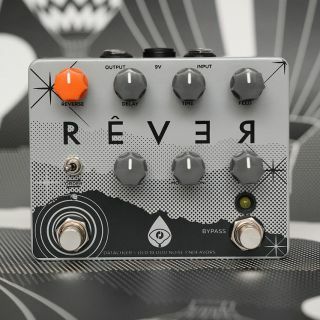 Old Blood Noise Endeavors and Datachoir have introduced the Rêver, a collaborative pedal that combines modulated reverb, delay and reverse. The feature-packed pedal is controlled by seven knobs, two toggles and two footswitches, with the ability to combine familiar effects to create new textures. Features include: a Reverb section with controls for mix, modulation, and reverb length; a Delay section with controls for volume, delay time and feedback; a Reverse section with controls for latching or momentary operation and blend between reverse and dry signal; the ability to switch orders of the effects; an expression jack for external control of the Reverse mix; an internal trimpot to control output level; and relay bypass switching and standard 9VDC center negative power. The Rêver is available for $229 direct from Datachoir in a limited colorway, or from participating dealers in the standard colorway, beginning February 15th. For more information, head over to DatachoirSounds.